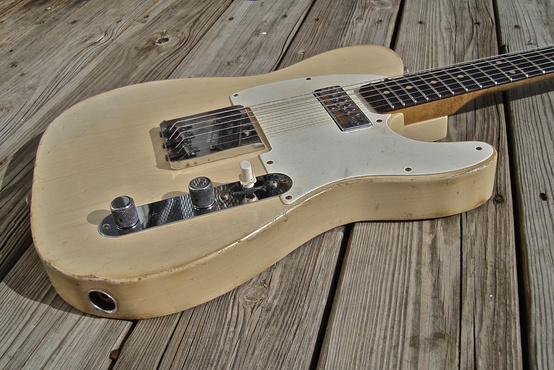 ShortScale :: View topic - Firebird pickup or Mini Humbucker in Tele neck? Posted: Thu Feb 04, 2016 11:34 am Post subject: Firebird pickup or Mini Humbucker in Tele neck? I want to try a new style of pickup in my tele neck position, I fancy trying a Firebird pickup or Mini Humbucker - but how do they compare to each other, can anyone help? Youtube vids seem a bit scarce for these pickups in the tele neck position, particularly the Firebird. Recommendations of actual pickups (not expensive) would be useful too. If you want to use both pickups at the same time, you should probably get something super low output like a Gretsch Filtertron. If you don't, then ignore what I wrote (I vaguely remember some older thread a few years ago saying you don't, but I could be confusing it with someone else's thread). Julian Lage has a Danocaster in which the neck pickup has been replaced with a vintage Teisco gold leaf pickup. Pickups can be found on ebay ranging from $50 to $100. Lollar sells a version of them but they are bit pricey. Nonetheless, the pickup sounds great on a tele. BRACE FOR CONFUSION AND POSSIBLY BRANDON AND I HAVING A DUST-UP: Fender used to market a model called the "Vintage Hot Rod 52 Telecaster". It's a 52 reissue with Seymour Duncan Firebird pickup in the neck. Except obviously Fender can't bandy the term "Firebird pickup" around, just as Gibson can't say "strat pickup". So they call it a mini-humbucker. Which can be confusing. So anyhow, loads of demos under that name. I love the sound f Firebird pickups, but they're very Fender-y to my ears. I also think a P90 sound godly in the neck position of a tele. Now your adding extra confusion suggesting a P90. I read a page by Lollar about the comparison and I think I like the sound of the Firebirds more. I'll have to see what's available. I used to have Epi minihumbuckers with polepieces. There was such a discription on the Dimarzio site that traditional minihumbuckers are "famous" for the sound that tend to sit inside the cabinet of your amp. That is exactly what I felt, you need to make an effort to scratch the sound out of them in comparison with full sized humbuckers and singles. Also they are not as transparent as singles, not even close. In my opinion they were great only for AC/DC type of music. Firebird pickups from what I hear, sound more transparent, but almost as thin as singles. I've just been thinking, my bridge pickup has a DC resistance of 14.23 Kohm. Most Firebird neck pickups i've seen have a resistance of 6 to 7K, will this cause an issue with mismatched output? Or could I put a bridge pickup (which have a higher output) in the neck, or will this sound odd? that's the guitar i played and wish i had bought it and that's when i fell in love with that pickup.. that's the exact one only the guitar was in natural. I adored it. I dream about it. It turns out that the output volumes of both my Dimarzio Pre-B1 (14.23) and my newly bought Dimarzio Vintage Minibucker Neck (6.11) seem to match quite well and sound pretty good together, so i'm happy. If I get some free time, I will.